StreamLines, an interactive project that merges art and science to advance the Indianapolis community’s understanding and appreciation of its waterways, will be unveiled Thursday, September 24, at 5:00 PM in Butler University’s Holcomb Gardens. The event, which is open to the public but requires an RSVP, will include environmental visual art by Mary Miss/City as Living Laboratory, musical works by local musical artist Stuart Hyatt a dance performance by Butler University Dance Department choreographed by Professor of Dance Cynthia Pratt. The dance will showcase musical pieces written and recorded for StreamLines. There also will be a poetry reading created for StreamLines and brief remarks from project partners Mary Miss, Dr. John Fraser of NewKnowledge.org and Mark Kesling of The daVinci Pursuit. StreamLines is the result of a $2.9 million National Science Foundation grant the Center for Urban Ecology at Butler University received to create sites along six Indianapolis waterways where arts and science will be used to educate the public about Indianapolis’s water system. The project features a collection of dance performances, musical recordings, poetry and visual art tailored for sites along the six Indianapolis waterways of focus to the Reconnecting to Our Waterways collective impact initiative—White River, Fall Creek, Central Canal, Little Eagle Creek, Pleasant Run, and Pogue’s Run. That art created for each site invites the community to learn, explore, and experience the science of local water systems through visual art, poetry, dance, and music. The project also incorporates an interactive website (streamlines.org), smart phone app and related programming to increase access, enhance interpretation and provide expanded opportunities for learning. 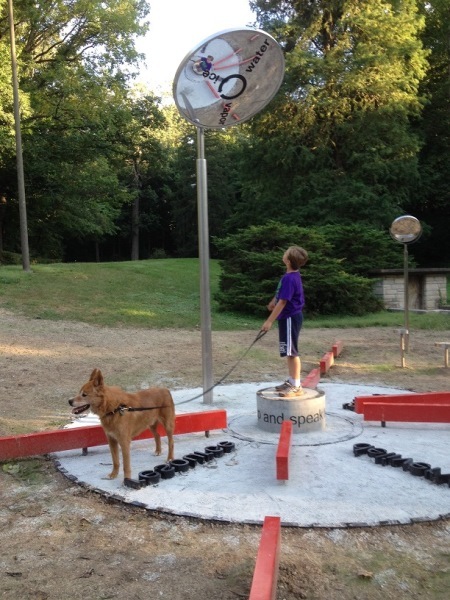 In the Holcomb Gardens installation, visitors will see a series of red lines, mirrors, backwards words, and a pedestal where they can stand so they can be in the center. All are designed to “provoke curiosity,” Miss said. Elsewhere, there are poems written on the mirrors and facts about the Indianapolis water system (“Water is essential for transport. Nearly all cities are built along waterways that are used to transport goods from one place to another”). There are even jokes: What is a tree that looks different on both sides? Asymmetry. Ryan Puckett, a spokesman for the project, said the objective is to inform Indianapolis about its waterways and to understand the impact water has on us, and to recognize the impact we have on water.